Sometimes I pick up a book, start it, and then promptly lose it in the black hole that I call a library. 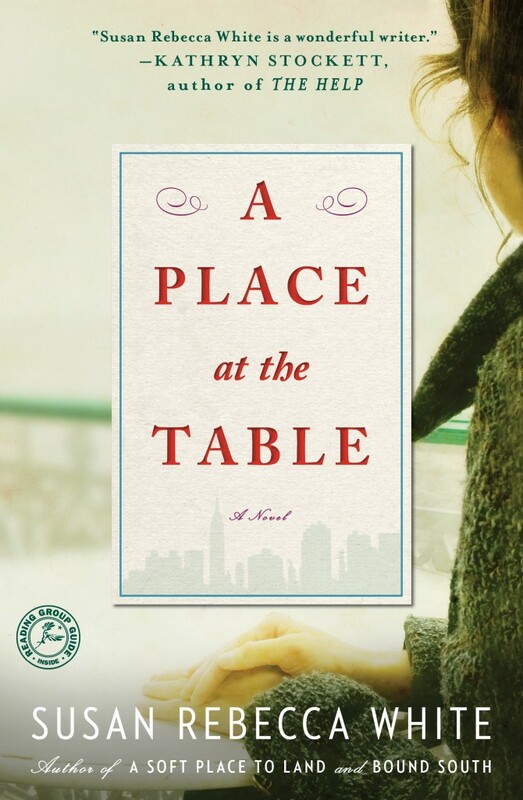 Such was the case with A Place at the Table by Susan Rebecca White. This is what my first paperback copy looked like. If you see it, please alert the authorities. I got through a little over half of the book before it went missing. I had not finished the book when I decided to use it for my hosting gig at Cook the Books. Determined that I would find it sooner or later, I went ahead and scheduled it for the December/January round. It would turn up, I thought. At the beginning of December, I still had not found it. I located a used cheap copy in good condition and started to reread. Susan Rebecca White’s novel, A Place at the Table, combines all of these elements. The novel’s prologue describes a disturbing scene in Emancipation, North Carolina during the late 20s, but the bulk of the novel takes place during the 1980s in Georgia, Connecticut and New York City. How does a character from an era of lynchings and fear intertwine with more modern characters trying to make their way in NYC? You will enjoy finding out the answer and following the three main characters of Alice, Bobby, and Amelia as they all make their way to find peace with themselves and the world around them. That was my blurb for the CTB announcement. Actually, I think it makes the book sound quite trite so kudos to those of you who continued on with the CTB challenge and read the book. As I read (and re-read parts), I found White to have combined elements of Southern traditions and mores and all the good and bad that these customs hold. 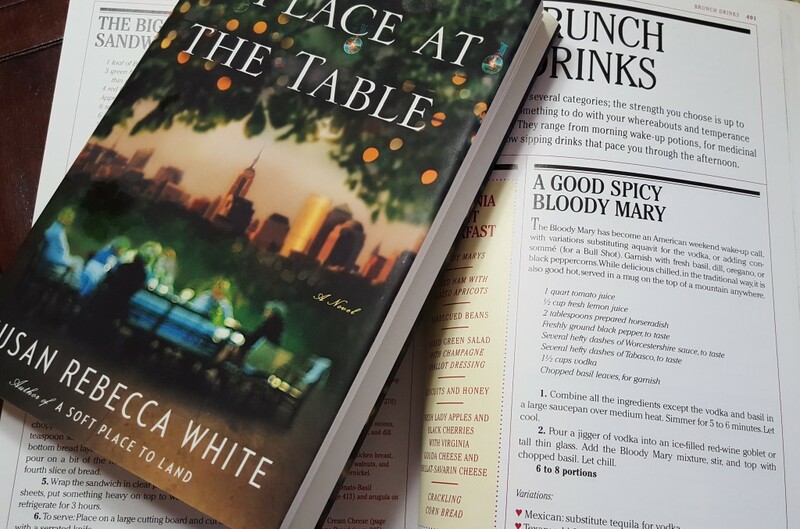 With inspired cuisine and accounts of the deeply personal struggles and trials of the characters, White held me captive as I waited to see if Bobby would recover from all of his losses, if Alice would ever reveal what really happened in Emancipation and if Amelia would ever realize what else life had to offer her. Gus and Meemaw are lovable characters that are oft quoted for their wise (and humorous) ways (especially in the first half of the novel). And, don’t forget that parting pound cake recipe. There were lots of Bobby’s inspired dishes that I could have created (and I hope some of the members do just that), but I kept coming back to the scene where Bobby meets Sebastian’s parents. Nervous, Bobby states a couple of times that he needs a drink to make it through brunch. Combine all the ingredients except the vodka and basil in a large saucepan over medium heat. Simmer for 5-6 minutes. Let cool. Pour a jigger of vodka into an ice-filled glass. Add the Bloody Mary mixture, stir, and top with chopped basil. This recipes makes a delicious mixer that you can whip up and keep in your refrigerator until needed. No, Mr and Mrs T for you either. May also use other herb garnishes like dill or oregano. I had to laugh when I started heating the ingredients for the mixer. Poor Bobby, I thought. If Sebastian made this cocktail like indicated in the cookbook, Bobby had to wait quite a while for his emergency cocktail. The book is full of other food references including but not limited to the famous chocolate mousse served at Cafe Andres, Bobby’s banana pudding trifle, his crayfish spread that he presents to Sebastian’s Kosher parents, Alice’s holiday baking, matzo ball soup, Amelia’s meal (including steak with bernaise sauce) for Cam, her pathetic Pepperidge Farm cheese sticks, Parrin’s “of the moment” dinner party menu, recipes from Homegrown, book launch parties. Besides the plethora of food, I also found some nostalgic comfort in White’s spot-on references to the 1980s and early 1990s in the novel. She captured both the hope and fear of this bizarre decade. This all being said, however, I did lose my patience with Amelia at times and I did think the final convergence of all the characters’ relationships was a bit odd. Ultimately, though, I did enjoy the book. As previously stated, I am hosting the current round for Cook the Books. If you are a quick reader, there is still time to participate. (For the announcement post, click here.) Anyone is welcome to join in. Simply create a dish inspired by the book and post about it. Then, email me (eliotseats@gmail.com) on or before January 31, 2016. Please include your name, your blog’s name, the name of your dish and a photo (or allow me to pull a photo from your website). Then, plan on joining us for the February/March book selection, The Unprejudiced Palate: Classic Thoughts on Food and the Good Life by Angelo Pellegrini (1948), hosted by Simona of Briciole. Also, stay tuned for more recipes from our after-Christmas get-together, including Gourmet Veggie Pizza, Cannellini Baked Beans, and Super Bowl Sandwiches. I am also participating in a very exciting event in February. More to come…. I have so many book that I am losing track also. It’s cold and rainy today and this bloody Mary sounds like the best idea I have heard so far! I need to utilize this more than I do. Besides this cocktail, I think the only other recipe I tried was for Zucchini Bread. I did find an amazing sandwich in the book that is on my to-do list now. I totally missed the Silver Palate cookbooks. Need to check them out. I do like their Bloody Mary recipe! Fun CTB! Thanks, MJ. Check it out! I have the set of Silver Palate cookbooks too (but then again, we ARE tracking age-wise, eh?) and I do enjoy them still. 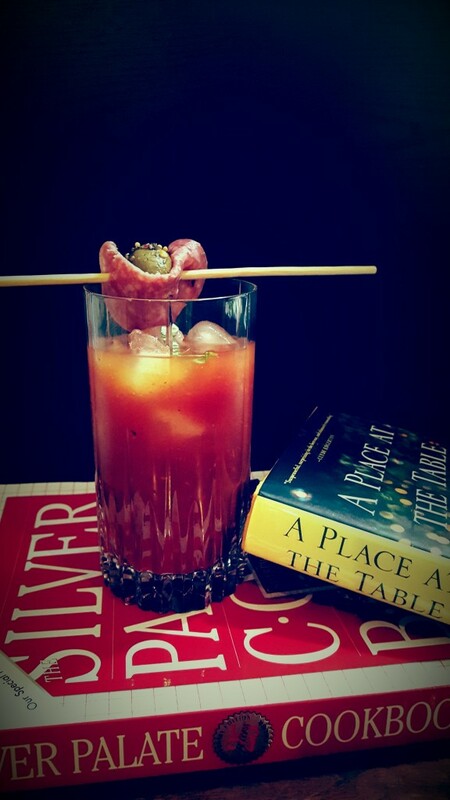 I’ll have to pull them out to see this recipe too and maybe I’ll make it for myself since I adore a good bloody Mary. Thanks for sharing your review of the book. I’ll have to check it out too. I’d never heard of the Silver Palate until this round of CTBC. Of course I wasn’t so much into the foodie scene in the 80’s. I really need to try this Bloody Mary though, after cutting the recipe down by quite a bit. Kudos to you for thinking to pull out your Silver Palate cookbook. I have the same book but not enough sense to take the hint and use it for a recipe LOL. Thanks for hosting, I enjoyed the book. I love that you added the variations! It’d be neat to try all of them. The Silver Palate Cookbook was one of my first cookbook purchases when I moved out on my own. I haven’t pulled it out for years I am afraid–not since I made the spicy shrimp when I heard Sheila Lukins passed away, I think 2009. What a classic though. 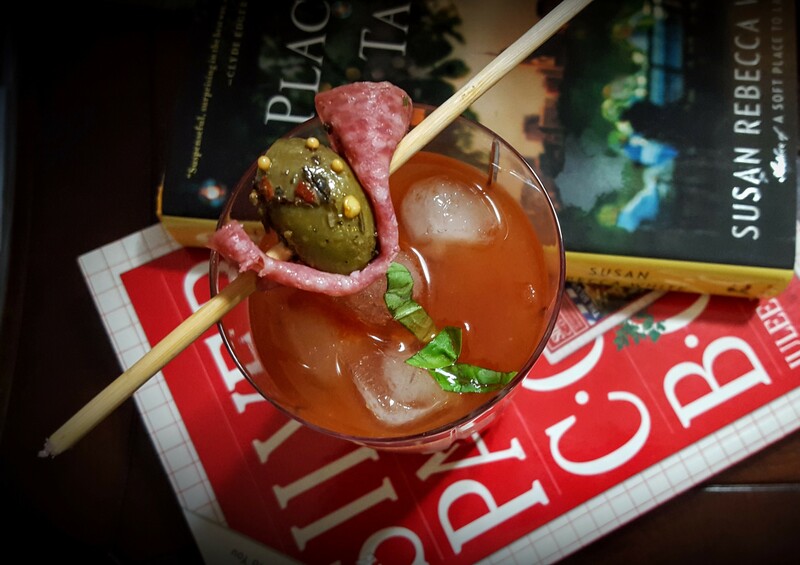 So fun that you pulled it out to find the Bloody Mary recipe! I love that you had the cookbook and were able to use the exact recipe from the novel! That is so meat! Now I need to get my hands on the Silver Palate! It’s always a pleasure to read your posts, Debra. Great choice of recipe! I enjoyed the novel quite a bit: I had not hear of it, so I am thankful you chose it. Bobby is certainly more rounded as character, as we see him growing up and growing old, while of Amelia we only get a partial view.